You should definitely give this okra recipe a try. It makes a great side dish or snack (it’s a Fuel Pull for you Trim Healthy Mamas because it has no significant sources of carbs or fats). I would recommend using medium-sized okra instead of huge like I did because the smaller ones are more tender. A good test to tell whether or not okra is too old to use is to try to cut through it. If it feels woody and you hear a crackling sound as you cut (and it will be stiff and difficult to cut), toss it because it’s gone tree-ish (random Lord of the Rings quote…isn’t that awesome?). 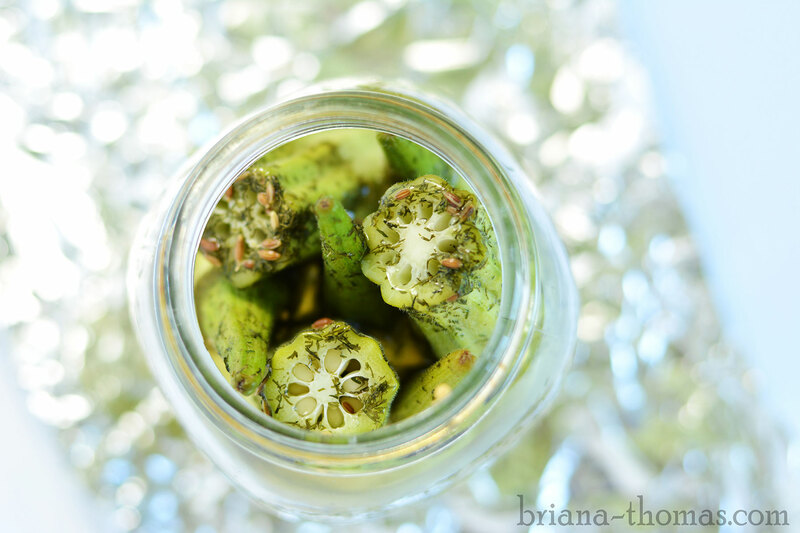 I refrigerated my okra for three days before tasting it. It was the perfect softness then. If you’re using smaller okra, one to two days might do it. You can pin this recipe here. Stuff okra into a quart-sized glass canning jar (I fit 8 large okra into mine). In a bowl, combine the rest of the ingredients and pour over okra. Fill the jar to within an inch of the top with pure water. Let it set a couple of minutes (the liquid will fill up the inside of the okra, decreasing the liquid level in the jar), then top the jar off with water again. 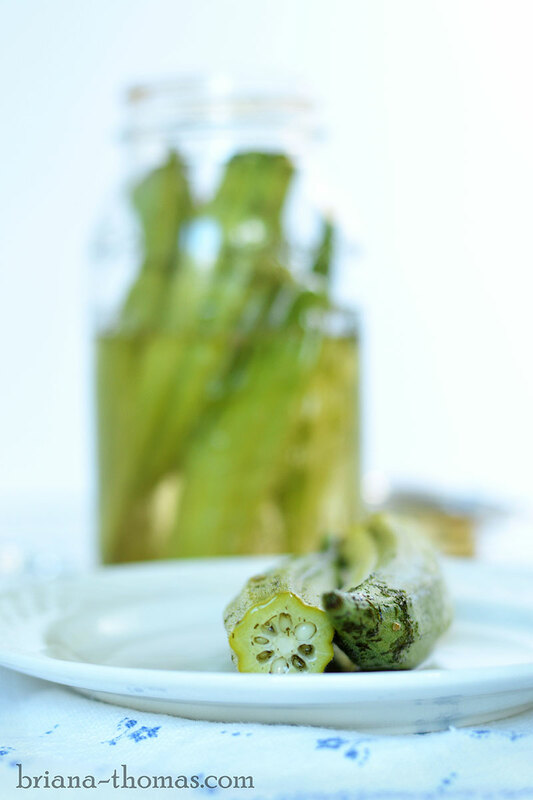 Let your jar of okra set in the fridge for 2-3 days to let the okra soften up and the flavors develop. Enjoy! 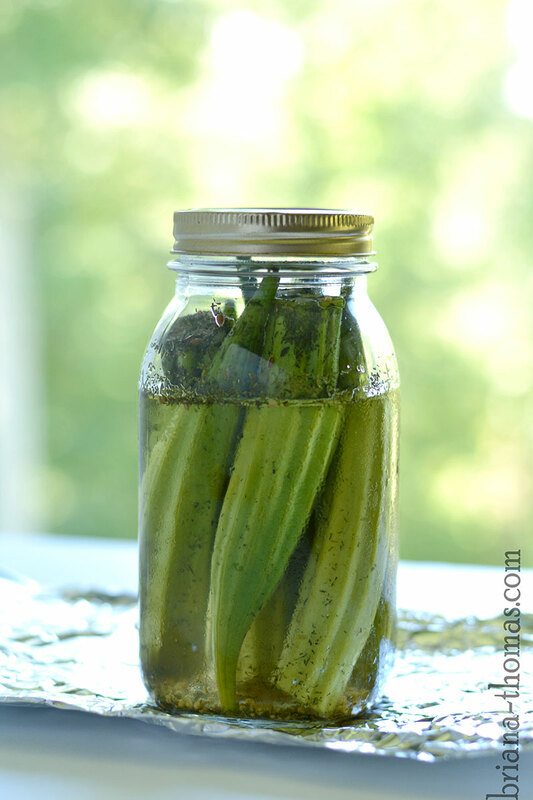 If the water level in your jar goes down as you eat the okra, it might be a good idea to fill the jar back up with one part vinegar to two parts water. This will help keep your okra fresher and juicier. It'll probably be OK as is, but the part of the okra that isn't in liquid won't be as moist, and while I haven't tested this theory, I have my doubts that it will keep as long. 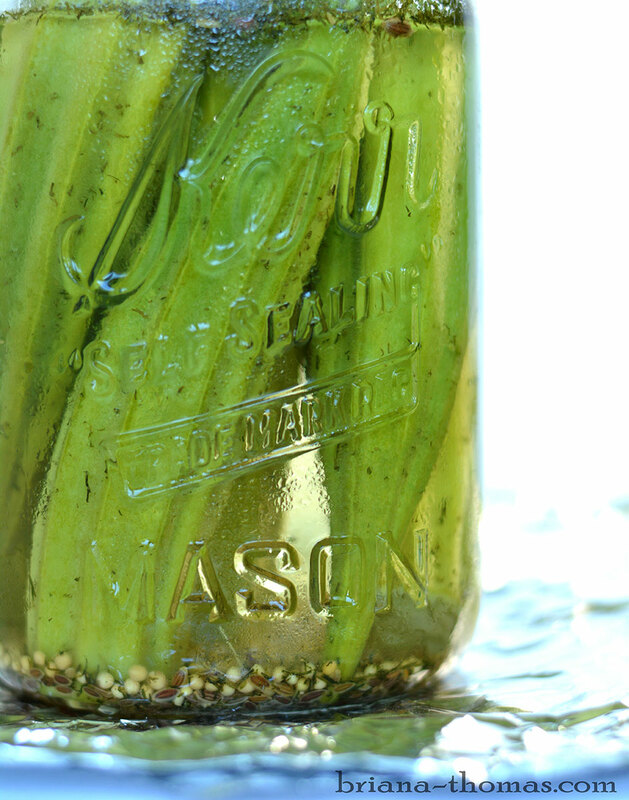 This refrigerator pickled okra lasts for several weeks in the fridge, although the flavors are most pungent in the first week. If your okra makes a crunching sound as you cut it (or if it's hard to cut), toss it because it's too woody. Smaller okra is better because it's more tender. I'm sure you could use apple cider vinegar if that's what you have on hand, but the flavor will be different. I chose white vinegar for the traditional pickling flavor. If you don't want sweet pickles, feel free to omit the sweetener. Thanks for the recipe. We will have tons of fresh okra shortly…we normally blanch them and put some in the freezer and we also give full baskets away. I love your blog. Just wanted to say thank you for blogging, creating and testing recipes to share with us. I don’t know how I would succeed with this ‘way of eating’ if it wasn’t for bloggers and kindhearted folks like you. No fresh okra available for me. Think it’s possible with frozen okra? I don’t think I’d try that. It would be mushy, I’m afraid. Would you say this is a close recipe to Isaac’s Restaurant pickles that they give? I’ve been looking for something close and it seems this might be it. ? I think theirs tastes like a cross between sweet and sour and dill. And you have dill in your recipe. Just wondering, thanks!